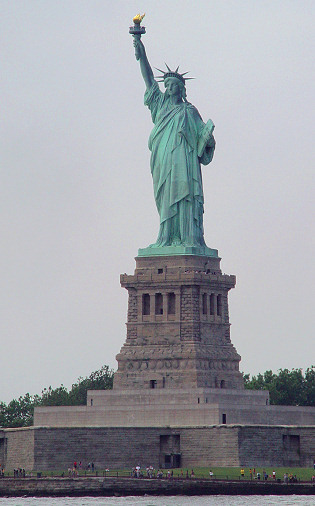 The Statue of Liberty, located on Liberty Island (which is in the State of New York). 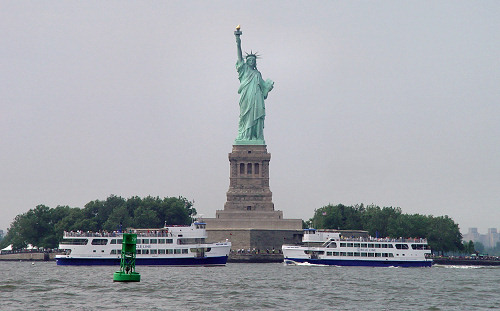 There are a couple of Circle Line tour boats in the vicinity (Miss New York at left, Miss New Jersey at right), and in the foreground is the buoy Green 29. Unfortunately, the quality of the light today was very poor, so the pictures required a lot of processing to bring out the details. Click on the right-hand picture to see a bigger version; use your browser's "back" command to return here. One of the great things about being on a boat in New York Harbor is that you can get great views of the Statue of Liberty and nearby Ellis Island. I remember years ago all the times I crossed the George Washington Bridge and looked downriver at the tiny blip that was the Statue. I even vaguely remember visiting the Statue as a young child. Now I got to see it again, from up close, as Jerome navigated right past the famous landmark. The Statue of Liberty was presented to America by the people of France as a gift commemorating the centennial of the American Declaration of Independence. It was finally erected in New York Harbor in 1886, ten years after the centennial, and has welcomed millions of immigrants in the past and is today welcoming millions of tourists and visitors. 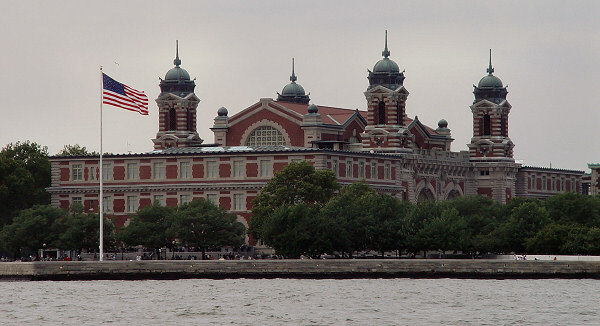 Nearby, Ellis Island was the portal to a new American life for over 12 million immigrants. 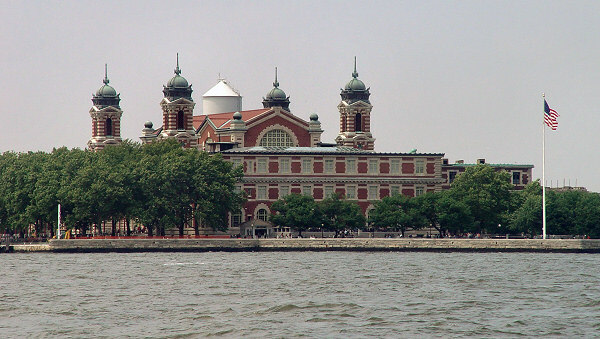 An overall view of Ellis Island. Although the island is connected to the New Jersey shore via a causeway, all present-day visitors must arrive by commercial tour boat. More views of Ellis Island.